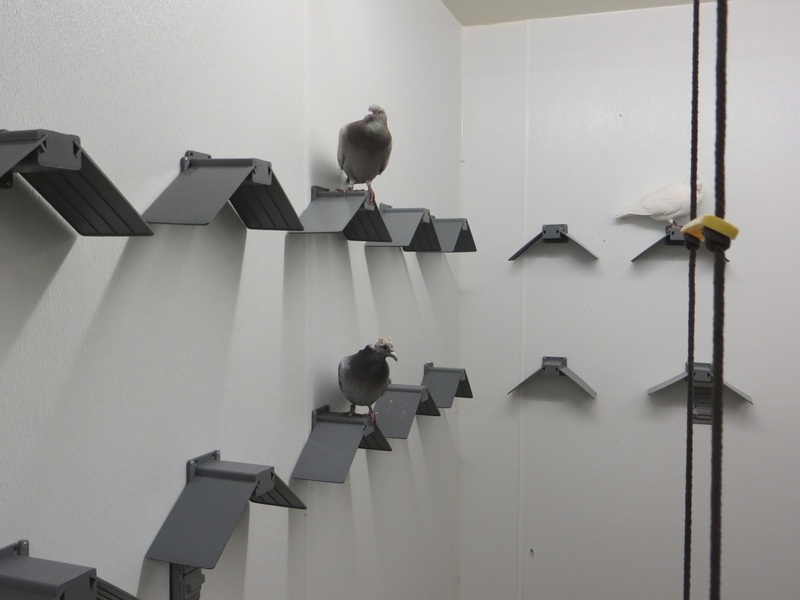 Male and female Rock Doves (pigeons) in this research facility raise their babies together in a large, open, indoor aviary. The aviary includes perches, swings, water baths, nest bowls, and foraging opportunities to stimulate the birds' natural behaviors. Parents will hatch one to three squabs (baby pigeons) on average. Both parents share the duty of feeding crop milk, nutrient secretions from the lining of the parents’ crops, until the squabs are approximately 30 days of age. At that point the young birds attend ‘homing flight training’ in an outdoor loft that resembles their indoor aviary. Training includes many weeks of free flight for about an hour each day. Birds are fitted with GPS trackers to keep them from getting lost while they learn their flight routes. When training is complete, they contribute to studies focused on understanding the neural mechanisms related to navigation and memory.